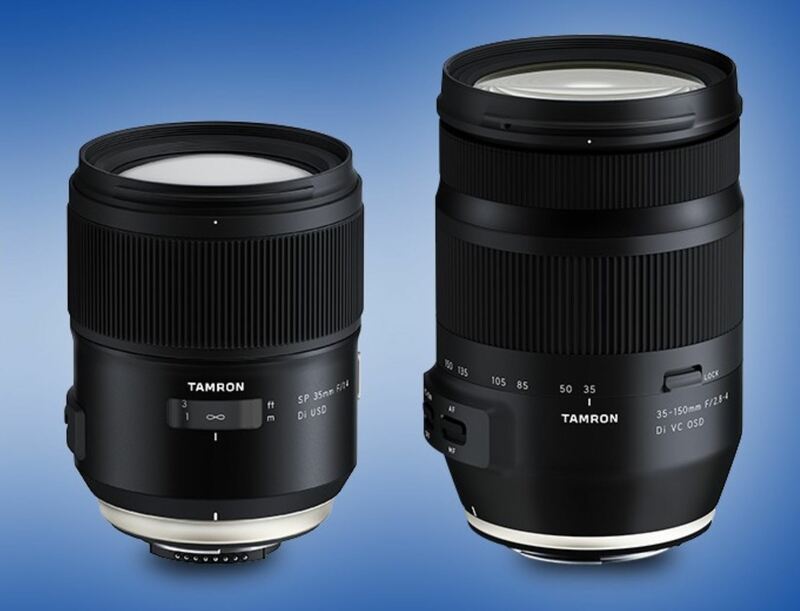 Development of Tamron SP 35mm f/1.4 Di USD & 35-150mm f/2.8-4 Di VC OSD Lens Announced ! Ahead of CP+ Show 2019, Tamron now officially announced the development of two new full frame DSLR lenses for Nikon F-mount: Tamron SP 35mm f/1.4 Di USD Lens (B&H Photo Video) and Tamron 35-150mm f/2.8-4 Di VC OSD Lens (B&H Photo Video). Both lenses will be available in the middle of 2019. February 20, 2019, Saitama, Japan – Tamron Co., Ltd. (President & CEO: Shiro Ajisaka), a leading manufacturer of optics for diverse applications, announces the development of two new lenses for full-frame DSLR cameras—the 35-150mm F/2.8-4 Di VC OSD (Model A043) zoom lens and the SP 35mm F/1.4 Di USD (Model F045) fixed focal lens; and a new high-speed ultra-wide-angle zoom lens for Sony E-mount full-frame mirrorless cameras—the 17-28mm F/2.8 Di III RXD (Model A046). Tamron will display these new lenses at CP+ 2019, the World Premiere show for camera and photo imaging, beginning February 28 through March 3, 2019 at Pacifico Yokohama and at the Wedding and Portrait Professionals International (WPPI), February 27 through March 3, 2019 in Las Vegas. The lenses are expected to launch in the middle of 2019. The new compact Model A043 is designed for fast handling and easy transport and features a zoom that extends from 35mm to 150mm, incorporating the 85mm focal length (often regarded as optimum for portrait shooting). It offers a fast F/2.8 aperture at the wide-angle end while maintaining a bright F/4 at the telephoto end. For close-focusing, the MOD (Minimum Object Distance) is 17.7 in across the entire zoom range. Delivering superb image quality, precisely placed LD (Low Dispersion) glass elements and aspherical lenses quash degrading optical aberrations. Furthermore, the Model A043 incorporates the Dual MPU (Micro-Processing Unit) system, which assures optimal AF performance and effective vibration compensation. Tamron’s SP lens series was born in 1979, based on the concept of delivering lenses for taking the perfect picture for those who love photography. This year marks the 40th anniversary of the series. In celebration, Tamron has developed the Model F045, the distillation of Tamron’s accumulated lens-making expertise and craftsmanship. This orthodox fixed focal lens, which some consider the most basic of all interchangeable lenses, is the embodiment of all optical technology and manufacturing knowhow Tamron has developed to date. The Model F045’s unprecedented high-resolution image quality and beautiful, appealing background bokeh lets photographers capture any scene down to the finest details. The external lens barrel was developed through tireless pursuit of operability and durability, focusing constantly on the needs of photographers. This lens is equipped with a fast F/1.4 aperture and high-speed, high-precision AF functionality offering exceptional reliability, plus various other features for increased convenience, making it the perfect everyday lens for your creative pursuits. It is ideally suited for nearly every photographic genre, including photojournalism, landscape, sports, street life, wedding groups and family snapshots. The Model A046 achieves an astonishingly small diameter for a high-speed ultra-wide-angle zoom lens, as witnessed by its modest 67mm filter size. Its unprecedented light weight and compact size provide excellent balance when used with a full-frame mirrorless camera, making it easy to carry, and enabling it to cater to a wide range of scenes and shooting conditions. The Model A046 offers a fast F/2.8 aperture throughout the entire zoom range and delivers high-resolution and contrast edge to edge. The combination of ultra-wide-angle focal length, fast constant F/2.8 aperture and Minimum Object Distance of 7.5 in at the wide-angle end encourages richly expressive and creative photography in a multitude of scenarios. The Model A046’s AF drive system is powered by the RXD (Rapid eXtra-silent stepping Drive) stepping motor unit, enabling it to deliver high-speed, high-precision and superbly quiet operation suitable for shooting video as well as still photographs. Note: All DSLR camera functions are possible when the Models A043 and A045 are attached to a mirrorless camera via the manufacture’s adapter. *Specifications, appearance, functionality, etc. of the above-mentioned three products are subject to change without prior notice. Previous Previous post: Tamron SP 35mm f/1.4 Di VC USD & 35-150mm f/2.8 DI OSD Lenses to be Announced Soon ! Next Next post: Tokina Opera 16-28mm f/2.8 FF Lens for Nikon F Mount Release Date in Mid March !